The Workbench Diary: Welcome and Hello. My name is Joshua Klein. I am a furniture conservator in private practice in the coastal town of Sedgwick, Maine. I got into this profession by first studying luthiery in Red Wing, MN. After that I attended The National Institute of Wood Finishing where I sat under the sagacity of Mitch Kohanek. Even though I knew I ultimately wanted to work on historic furniture, I took a job for a short stint in Nashville, TN at a custom guitar shop. I was the finisher for this small company. It was fun but as soon as my wife, Julia, and I had our first baby on the way, we decided to head back to where we wanted to plant our family: the Maine coast. We moved up and had our first little boy, Eden. After we got our feet under us a bit, I started my furniture restoration business full time. Since the beginning my focus has been on developing a conservation methodology in practice. I use this blog to post quick how to’s, treatment reports, period woodworking methods, meditations on craft, etc. I also have been sharing about my research into Jonathan Fisher, an early 19th century cabinetmaker from Blue Hill, ME. Since I am currently working on the manuscript for a book about him fruit from that work appears on the blog every so often. We live a homesteading lifestyle so I occasionally include snippets about our chickens, goats, building our outdoor mud oven, splitting firewood, etc. You will see a “Search This Blog” bar on right hand side of the blog for your surfing convenience. Right below that, you can subscribe or follow by email. Sign up and you’ll get notices when I post something new. Lastly, you will notice the extensive blogroll in that right column. These are the numerous blogs I follow. The list is organized by most recent post. I have friends that come here to see what’s new on my blogroll. I check it everyday and have found it handy. Feel free to stop in and check out what’s new in the handtool woodworking blogosphere. Welcome to my blog, new friends. Feel free to leave comments. That just fuels the fire here. The more feedback I get, the more end up posting. Thanks for coming. Enjoy. 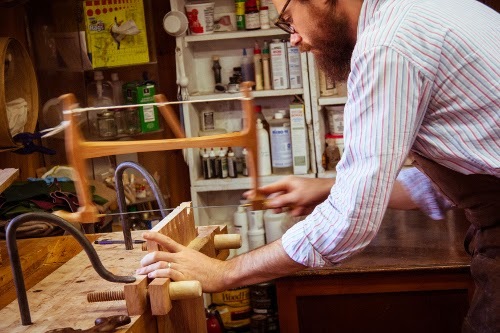 Klein Furniture Restoration from Mathias Reed Visuals on Vimeo.